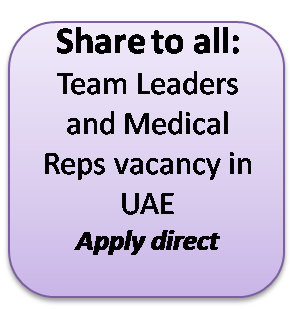 If you are not interested in Team Leaders and Medical Reps vacancy in UAE job, please share to many so that we can help any jobless professional. 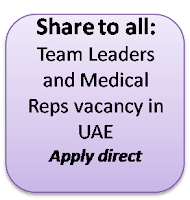 The vacancy we found is in Pharmalink, a fastest growing pharmaceutical distributor within UAE. You may please go to this page to get all details and related information about this vacancy. Please note that, this is absolutely a direct applicable job. The job is to work as a Team Leader of Medical / Sales Representatives. 1: For the supply of Medical Consumables items. 2: For the supply of Pharmaceutical / Medicine products.